The Lakewood BlueClaws became the ‘Low-A’ minor league affiliates of the Philadelphia Phillies beginning with their relocation to that New Jersey community for the 2000 season. 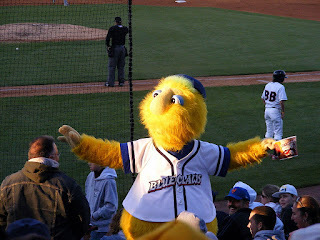 The BlueClaws play their home games at FirstEnergy Park. Built in 2001, the ballpark seats nearly 6,600 fans and has hosted outdoor concerts by big names, including the legendary Bob Dylan. Lakewood, New Jersey is approximately 69 miles northeast of Philadelphia. It is about an hour-and-twenty-minute drive starting out either on I-95 or the New Jersey Turnpike, and finishing up along I-195. In the 2018 season the BlueClaws finished in first place in the North Division of the South Atlantic League. In fact, their 87-51 mark was the best by far in the entire SAL. Despite their fantastic regular season, Lakewood fell short of a championship. The BlueClaws swept Kannapolis by 2-0 in the playoff semi-finals, then edged Lexington by 6-5 in the opener of the finals. However, Lexington roared back to take three straight by scores of 5-2, 6-3, and 2-1 to capture the SAL championship. This year’s BlueClaws Player of the Year is Zach Warren. The 6-5, 200lb reliever turned 22-years-old in early June. He was the Phillies 14th round choice in the 2017 MLB Amateur Draft out of the University of Tennessee. The hard-throwing southpaw reliever registered 15 Saves this season, appearing in 39 games. Over that span the lefty dominated opposing hitters, allowing just 33 hits across 56.2 innings with a 100/28 K:BB ratio. Warren fashioned a 3-2 record with a 1.91 ERA, a 1.076 WHIP, and was tagged for just two home runs this year. He became the closer for the BlueClaws in June after starting out the season in middle relief. As with Ben Pelletier, named yesterday as the short-season Williamsport Crosscutters Player of the Year, Warren has not yet shown up on any of the Phillies top prospect lists. However, there is always a place for a tough lefty reliever. Should he repeat his dominating performance when next season gets underway, Warren is sure to begin popping up on evaluator radar screens. Originally published by Phillies Nation as "Lakewood BlueClaws Player of the Year: Zach Warren"